Enjoy a 2.5 hour private tour Madrid highlights with a top-rated guide specialized in working with kids and families. She will use ipad and other visual tools and techiniques to make history come alive while visiting Plaza Mayor, Puerta del Sol, the Royal Palace other other famous monuments. Both children and parents will learn and have fun playing trivia, games, scavenger hunts and other educational activities. Close your eyes and imagine Madrid as it was centuries ago! What was it actually like when this city was a Moorish fort? How did the city change when it became the seat of the Kings of Spain? We shall explore these questions and many more during this 2.5 hour Madrid walking tour for kids and families. Visiting the famous Plaza Mayor and Puerto del Sol in the company of a top-rated guide, specialized in working with children. 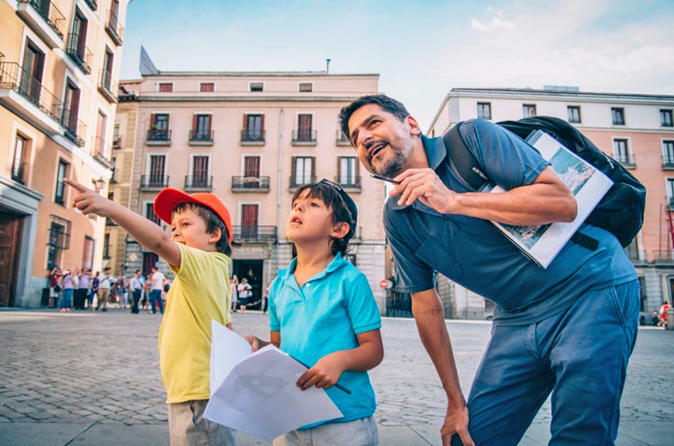 The guide has a number of hands-on activities that will bring Madrid’s history to life and enable the children to seek answers to the questions posed and to see Madrid from several different aspects. The tour begins at the Opera House in central Madrid from where we take a walk back in time. We learn about the founding of Madrid and discover the remains of the Muslim settlement – its 9th century walls – where we shall consider life during these primitive years and speculate about how the walls might have been built. We shall spend some time exploring the exterior of the magnificent Royal Palace where we shall contemplate the lives of the young princes and princesses who lived in the castle. How did their lives differ from that of the average citizens? The tour also takes us to the spectacular Piazza Mayor where we will conjure up images of the square over the centuries and the various uses to which it has been put – market square, bull fighting ring and even a soccer stadium! We shall think about the shops which are hidden away under the archways and imagine what they sold all those years ago. We may even make a brief stop in a nearby historic café that is still used by the “madrileños” today, for a drink and a traditional sweet. We then make our way through the small back streets to the city’s current central square, Puerto dl Sol where we will take the time to discuss modern-day Madrid. The kids will come away from this wonderful experience knowing how Madrid has evolved over the centuries to be the vibrant capital city that it is today.